List of Author(s): Jeffrey ES, Banta JE, Modeste NN, Dos Santos H.
Copyright: © 2018 Jeffrey ES, et al. This is an open-access article distributed under the terms of the Creative Commons Attribution License, which permits unrestricted use, distribution, and reproduction in any medium, provided the original author and source are credited. Childhood obesity is a cause of concern in the United States due to its consequences to children and long-term consequences when these children become adults. Readily identifiable causes include the consumption of high caloric foods, low intake of fiber, sedentariness, and lack of physical activity. Other issues might be involved, such as family structure, which is the main objective of this study. Data for this study are from the National Health Interview Survey (NHIS), 2008-2015. Study subjects were Latino children between the ages of 5-12 years, having BMI data, who lived in households with one of the following: married couples (nuclear), single mothers, unmarried couples, extended families, or blended couples (with step-parents). Our study showed that blended-households with step parents had children who were 2.6 times more likely of being obese compared to nuclear family households. Similarly, extended family households (where there was an extra adult other than the parents living in the household) had children who had 53% greater odds to be obese compared to nuclear households. College graduates had children with a 71% lower odds of being obese. Children whose parents spoke only Spanish had a 32% lower odds of being obese compared to parents who spoke only English. Girls had a 30% lower odd of being obese than boys and it is clear that family structure, particularly extended family and blended family households, had a large influence on childhood obesity in Latino children between 5-12 years old. Therefore, childhood obesity interventions interventions should take into account their original culture keeping traditional behaviors that protect against childhood obesity, education of the parents and male gender. Childhood Obesity, Latinos, Household Structure, Education, Income, Gender, language. Childhood obesity is increasing throughout the United States, and this is of major concern since research studies have shown that obesity in childhood is an independent risk factor for obesity in adulthood . The prevalence of childhood obesity among Hispanics is 21.9%, and higher than African-Americans (19.5%) and Caucasians (14.7%) . Similarly, the prevalence of Childhood obesity in Latino children between 6-11 years old is 25% compared to 13.6% in non-Hispanic whites . Childhood obesity is associated with some specific family characteristics such as single parent households, family cohesion, conflict, disorganization regarding time management, and lack of interest in social and cultural activities . Regarding family structure, data among Latinos is limited. In the general population of the U.S., preschool children raised by unmarried biological parents have a 65% greater likelihood of being obese compared to children raised by married biological parents and two times more if raised by a relative . Parental relationship status has been tied to child development outcomes such as body mass index (BMI) and obesity . Currently, 41% of children in the United States are born to unwed women, and research shows that children have better developmental outcomes such as healthy weight status in married, biological-parent households than in other family structures; this is because of increased levels of economic resources, social support, and relationship commitment as well as decreased stress in married couples. Married parents are more likely to educate and control the lifestyle of their children, and this consequently prevents overweight and obesity status. Children from married biological couples are more protected from behaviors such as overeating and indulging in countless hours of video games . A study focused on understanding the cultural roots of childhood obesity in Latinos showed that low-income earnings in households contribute to the unhealthy dietary choices that parents make for their children . Also, neighborhood determinants such as living in communities with an influx of fast food restaurants increased childhood obesity among Latino communities . Furthermore, among extended Latino family households, friends and neighbors, it is a common practice for members of the family to distribute and share food with each other. Similarly, fathers who do not live in the same house as their children often either bring food to their children or take them out to eat and such foods are usually unhealthy with high caloric density . There is limited data on the association between family structure and Latinos. Hence, we examined the association of childhood obesity with household structure among Latinos between 5-12 years old. This cross-sectional study focused on the influence of household structure on BMI of Latinos between 5-12 years old. Data are from the National Health Interview Survey (NHIS) for survey years 2008 to 2015. The NHIS employs a complex sampling design and contains data from all 50 states in the nation and has a sample size of about 87,000 surveys from approximately 35,000 households per year . To assist researchers, multiple years of NHIS surveys have been combined into one system called the Integrated Health Interview Survey (IHIS) . The University of Minnesota and Minnesota Population Center owns all the rights to the database, and they permitted us to use it for the study. The questions generated from the databases were from interviews in a questionnaire format and includes variables such as Census region (Northeast, Midwest, South, and West), demographics, family income, and, parental education . The parents of the children self-report the answers to the questionnaires. For example: for living arrangements, they asked, “Are they a married couple? Are they an unmarried couple? Are the mothers biological or non-biological with children? Are the fathers biological or non-biological with children? Is either of the parent stepparents? Is either of the parents an adoptive parent? Are the parents married or unmarried parents?” etc. . Participants were Latino children between the ages of 5-12 years old. Parents from identified households selected one of their children and answered the questionnaire about them. The domains for the definition of Latino included: Hispanic/Spanish origin, Mexican, Mexican-Mexicano, Mexicano, Mexican-American, Chicano, Puerto Rican, Cuban/Cuban-American, Dominican (Republican), Other Hispanic, Central/South American, Other Latin American, and Other Spanish . The sample size was 1,333 Latino children between the ages of 5-12 years for whom BMI data was available. There were 28,280 children with missing BMI data. Body Mass Index (BMI), the dependent variable, was used as a categorical variable following the reference categories for childhood obesity percentiles from the CDC. Childhood obesity is categorized as a ≥ 95th percentile. BMI was used as a dichotomous variable and with levels above and below the 95 percentile. BMI was calculated based on the parent’s report of height and weight. There was significant missing data. Nuclear: a nuclear family consists of one or more children living with two parents who are married to one another and are each biological or adoptive parents to all children in the family. Single mother: a single-mother family consists of one or more children living with a single adult mother. Single father: a single-father family consists of one or more children living with a single adult father. Cohabiting: a cohabiting family household consists of one or more children living with a biological or adoptive parent and an unrelated adult who are cohabiting with one another. Blended: a blended family household consists of one or more children living with a biological or adoptive parent and an unrelated stepparent who are married to one another. Extended: an extended-family household consists of one or more children living with at least one biological or adoptive parent and a related adult who is not a parent (example, an adult child, aunt, uncle, or grandparent). The covariates we used in the study were parental education, geographic location, household income level, gender, the language of interview, and the number of children in the household. For parental education, the categories were less than high school degree, high school graduate, some college or associates degree, and, college graduate. The parental education category was based on the highest education of the parent in the house. Similarly, geographic location was categorized into four regions of the United States: West, Northeast, Central/Midwest, and South. Additionally, for income, the categories were less than 100% Federal Poverty Level (FPL), 100% to 175% FPL and greater than 175% FPL. The FPL was determined using reported total family income which was compared to the U.S. Census Bureau poverty thresholds for the year; these thresholds are based on both family size and the number of children under age 18. For example, the FPL for a family size of four including two children under 18 years old is $24,339.00. Moreover, for the language of interview, the categories were English only, Spanish only, and both English and Spanish. These were the options available for language which was used to conduct the interview. Finally, for the number of children in the household, the categories were only 1 child, 2 or 3 children, and 4 or more children . The first analysis included a description of all the variables between the two groups, obese and non-obese (Table 1). The second part was about the association between household structure and BMI (Table 2A). The nuclear family was chosen as the reference category based on the guidelines from the National Center for Health Statistics . The same guidelines were followed to determine the family income reference category of less than 100% Federal Poverty Level (FPL). For region, the reference category was West, and for parental education, it was Less than High School Diploma. For gender, Males was the reference category, and for language of the interview, English was the reference category. For number of children in the household, Only 1 Child was the reference category . Table 1: Descriptive of the Obese Vs. Non-obese data of 5-12-year-old Latino children (%). Table 2A: Family Structure variables and BMI levels of 5-12-year-old Latino children. Odds ratio and confidence intervals from the 2008-2015 Integrated Health Interview Survey (IHIS). Table 2B: Family Structure variables and BMI levels of 5-12-year-old Latino children controlled for all demographic variables. Odds ratio and confidence intervals from the 2008-2015 National Health Interview Survey (NHIS). The third part was done to determine the impact of all the family structure variables and covariates on BMI of Latino children between 5-12 years old in a multi-regression model. Finally, we compared the data used in the study with the missing BMI data and reported it in Table 3. SAS 9.4 (SAS Institute, Inc., Cary, NC) software was used to analyze the data. Table 3: Descriptive of Missing Vs. Non-missing data of 5-12-year-old Latino children. Descriptive of Missing Vs. Non-missing data of 5-12-year-old Latino children, NHIS 2008-2015. Out of a total of 1,333 Latino children between 5-12 years old, 294 of them were in the obese category, and 1,039 were non-obese. Using an estimation of a small effect size (f=0.15), power was set at 80% and alpha at 0.05 . The sample size was large enough to reject the null hypothesis that any difference seen is due to chance. There were no dropouts because this was a cross-sectional study and based on secondary data. For the obese children, the highest percentages of family structure variables were: 39.5% in the Extended Family category followed by Nuclear Family with 29.6% and Single Mother with 15.0%. Also, 56.8% were Males, and 43.2% were Females (Table 1). For region, the two highest percentages in the obese category were from the West with 42.9%, and South, 35.7%. This shows that childhood obesity in this sample of Latino children between 5-12 years old is more prevalent in the West and South regions compared to the North Central/ Midwest and the Northeast (Table 1). For Parental Education, the highest percentage in the obese population was less than High School Diploma with 41.2%, followed by High School Graduate with 25.2%, then by Some College/Associate degree with 23.5%. Looking at the family income, Greater than 175% FPL had the highest percentage of the obese population with 34.0%, followed by Less than 100% FPL with 31.0% and 100 to 175% FPL with 25.5%. This shows that almost 1/3 of Latino households with obese children between the ages of 5-12 years old have parents who earn less than 175% of the Federal Poverty Level (Table 1). Regarding interview language, in the obese category, English only was 60.2%, Spanish only was 23.8%. For family size, in the obese category, Parents with Only 1 Child was 32.3%, Parents with 2 or 3 Children was 59.9%. Therefore, majority of the families have 1-3 children and the minority 4 or more (7.8%) shown in Table 1. For household structure alone without controlling for potential confounding variables, single mothers had 55% greater odds to have obese children; similarly, blended families had children who had 2.32 times greater odds of becoming obese; and extended families also had children who had 48% greater odds of becoming obese (Table 2A). After individually controlling for potential confounding variables like region, gender, interview language, income and family size, single-mother households had children who had 41% greater odds of becoming obese, but this was not statistically significant (Table 2B). However, the blended family households continued to have a significant association, and blended families’ children had 2.65 greater odds of becoming obese compared to nuclear-family households (Table 2B). Extended families also maintained its association, and now their children had 53% greater odds of becoming obese (Table 2B). After controlling for all the potential confounding variables, children in households where parents had college degrees had children who had 71% lower odds of being obese and those whose parents attended some college had 34% lower odds of being obese. Nevertheless, females had 30% lower odds of being obese than males. 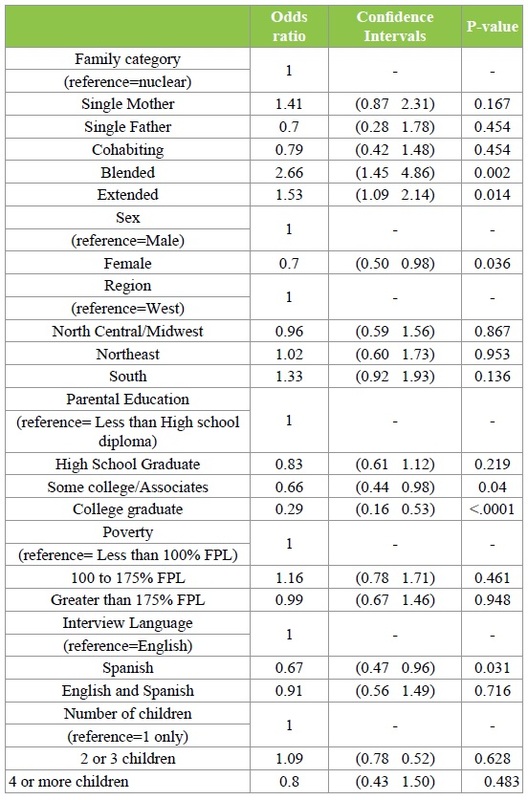 Also, parents who spoke only Spanish had children who had 33% lower odds of becoming obese compared to parents who spoke only English (Table 2B). The main objective of the study was to determine the associations of household structure on Body Mass Index (BMI) of Latinos in the U.S. 22% of Latino children between 5-12 years were obese (Table 1). This is consistent with literature, for example, according to Ogden, 25% of Latino children between 6-11 years old are obese compared to 13.6% in Non-Hispanic whites . Blended family households had children who had 2.65 greater odds of becoming obese compared to nuclear-family households (Table 2B) “Step-families with blended children may experience complex routines which are more likely to result in less healthy meals and exercise patterns” (p.3) . Even though the results from Augustine are from the general population and preschool children, we could estimate that the higher rates of childhood obesity observed in blended family households were likely to be caused by stress due to children adjusting to different parenting styles, lack of social support by either of the parents and lack of quality time to educate and motivate for healthy behaviors. After controlling for all the potential confounding variables, extended-family households had children who had 53% greater odds of becoming obese (Table 2B). In Latino households, it is common practice to distribute and share food with family members, friends, and neighbors; similarly, nonresidents fathers often either bring food to their children or take them out to eat and such foods are usually unhealthy and rich in calories . Furthermore, children who live in relative-headed households are 2 times more likely of becoming obese compared to married parent households . Therefore, our results with the Latinos somehow matched the results found in the general population of children in the US. This feature might be because if older people, like grandparents, are taking care of the children, they might not have current nutrition information and the ability to promote physical activity such as playing with the children . Children in households where parents had attended some college had 34% lower odds of being obese compared to children with parents who had less than a high school diploma; similarly, children in households where parents had college degrees had children who with 71% lower odds of being obese (Table 2B). This is consistent with findings from the literature that children who were raised by collegeeducated mothers had a lower likelihood of becoming obese compared to children of mothers who did not have high school degrees . Whitaker & Orzol also found that rates of childhood obesity in preschool children in families with mothers that have a college degree were much lower (10.6%) compared to families with mothers with less than high school education, high school degree or equivalent and some college which rates were 29.8%, 29.1%, and 30.4%, respectively . This confirms our results that childhood obesity rates are lower in highly educated families. Even though there is some evidence that single motherhood would be a factor for childhood obesity, education of the mother seems to be more important . In our study, we started to see that single mother families were associated with BMI (Table 2A), but when we add all the variables, the effect was not significant anymore (Table 2B). Girls had a 30% lower odds of being obese than boys (Table 2B). This is consistent with the study by Augustine & Kimbro, which shows that Latino female children were 19% less likely of becoming obese compared to Latino male children . This trend is probably due to the perception of body image in our mainstream culture that promotes the perception that slim females are attractive. Also, probably, Latino boys would spend more time in the computer, video games, and TV. Finally, parents who spoke only Spanish had children who had 33% lower odds of becoming obese compared to parents who spoke only English (Table 2B). This could be because they were less acculturated and therefore were accustomed to cooking food rather than consuming highcalorie dense foods that cause obesity. Future interventions aimed at reducing child obesity must convey how information on the health and nutrition of children are tailored not only to parents, but other caregivers such as relatives, step-parents, and other adults who interact with children on a regular basis. It is also important to address the issue of stress on extended and blended families that might affect children’s eating behavior. Finally, schools, pediatricians, child care providers, and other important adults and institutions in the lives of children must be cognizant that household structure can contribute to obesity risks in children . Also, tailor intervention programs to low educated families, addressing the higher rates of obesity among boys and the acculturation issue. A few limitations of this study included, first, the missing data. The missing data has a higher number of families with 4 or more children (23.2%) which could be more common among Latinos and could have a different and even significant result for the comparison of that category and BMI (Table 3). However, considering the rates of obesity in Latino children found in the literature, 25% , our rates of childhood obesity are very similar, 22% (Table 1). Therefore, we might not be missing much of the total obese population of Latinos. The data was obtained from the National Health Interview Survey (NHIS) and consequently a secondary source. Other limitations are the use of self-reported variables such as height, weight, and income. These self-reported variables may not be accurate. Also, parents chose the child they wanted to include in the interview, and this could have caused selection bias. Additionally, in the extended family household, the extra adult may not have been a grandparent but could have been any adult relative. Future studies must consider obtaining the data through a primary source such as a researcher directly interviewing participants for the study. The outcome of this study showed that extended and blended households among Latinos have the highest impact on BMI. Childhood obesity interventions must address and target other aspects of household structure in Latino families by educating and teaching parents, grandparents, aunts, and uncles about risk factors of obesity such as heart disease, diabetes, hypercholesteremia, sleep apnea, and low self-esteem. They also must be aware of the influence of stress on health behaviors of eating and exercising. Stress management interventions should be implemented for Latino families. School teachers and counselors can impart knowledge about healthy choices about diet and the need for exercise. Policies are needed to implement healthy diets in school settings as many students only have meals at the school. Policies are also needed for mandatory exercise for this group of children to fulfill the advised one hour per day. It is also important to provide mentors and role models for Latino children to increase their motivation for healthy behaviors. Regarding acculturation, our study showed that parents who preferred the interview in Spanish have children with lower risk of obesity compared with parents who spoke only English. Hence, this could be due to the cultural values of such Latino families which have not been affected by acculturation and assimilation to Western foods that increase the risk for childhood obesity such as consumption of high sugar and caloric foods. Latinos families must continue enforcing traditional foods in their households and probably sports or exercises that are culturally meaningful to them. Future studies must ensure that data such as weight, height, and BMI are measured by researchers for accuracy. Also, the sample population should be based on random selection or parents must answer the questionnaire on all their children to prevent the possibility of selection bias. The outcome of this study showed that extended and blended households among Latinos have the highest impact on BMI. Childhood obesity interventions for Latinos must include features to reach the extended members of the family and address the stress caused by such family structures. Additionally, for family structure, there is a need for more family services, lectures and sessions for Latinos that address the issue of stress among children and the impact on their health, especially, obesity. Also, it is necessary that the schools develop plans to encourage children to participate in sports and other physical activities after school and, also, that policies for healthy diets and mandatory exercise be designed by the school district.